Black Knot of Prunus is caused by the fungus, Apiosporina morbosa, and is characterized by thick, corky, elongated gall-growths on twigs and branches. The common name of the disease is based on the coal-black coloration of older galls late in the growing season. Currently, newly sporulating black knot galls are olive-green or reddish brown and may have a velvety texture. Newly forming galls may appear as simple swollen growths causing the bark to crack; they may be mistaken for a cankering disease. 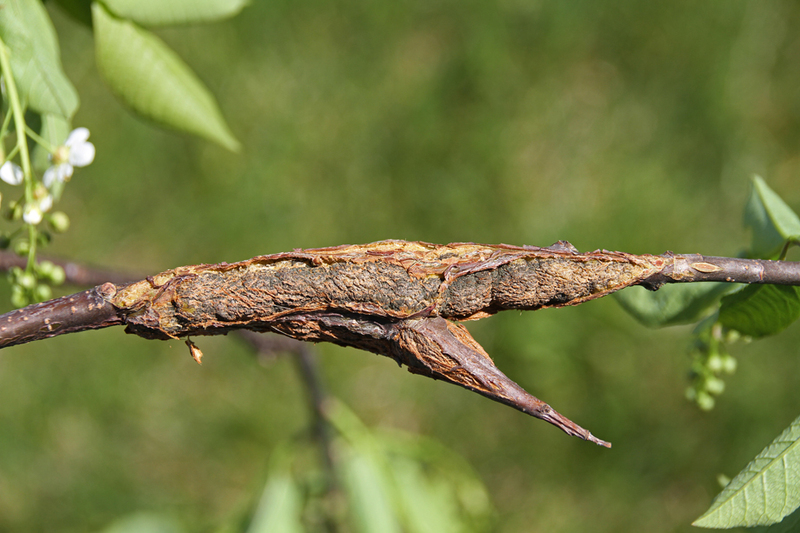 Later in the season, the galls may develop a white or pick discoloration caused by the fungal parasite, Trichothecium roseum. Although black knot is primarily associated with cherry and plums, fungal galls have been recorded on 24 species of Prunus.